I recently made a name change to this blog (as my tiny band of followers may have noticed), and basically swapped a three-letter word for a two-letter word. What I discovered is that it caused a major, and very positive, change to the meaning of my title. One wouldn’t think simply swapping the word “for” for the word “in” would warrant this much attention. (I mean, REALLY, Jill! How much can you talk about this?!) There ended up being such a profound change in meaning, and a very slick double meaning, that I just can’t resist going on about it for a bit. The other meaning is that swimming is a way to think of moving through your life. “For your life” is detached and feels external, as though your life is over there somewhere. “In your life” is intimate, personal and immersive, and fits much better with the idea of swimming. When we swim in water, the water envelops us, touching us everywhere; we feel it with our whole body, and our whole body is involved in moving through the water. 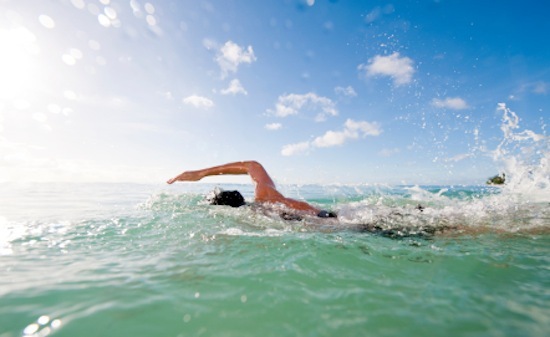 To get into water, we jump, plunge, leap, or at least slide in and commit. Swimming, like life, requires you to be all the way in—it does not happen to you, you must take charge and make it happen. A small word change, a happy accident. Immerse yourself in your life, use all of your mind and senses to feel it and move through it, make it happen. Swim in your life.